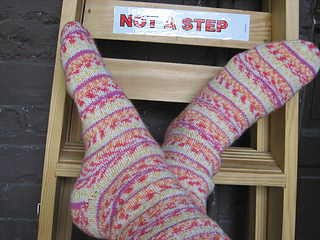 There are three different styles of knitted socks in the front of the book. This is the third one: knitted from the top down with a short row heel. Just plug in your own stitch pattern and cast on number. The book provides techniques for determining your own sock pattern according to the gauge you get with your yarn and needles. It contains charts with suggested foot measurements by shoe size, leading to a chart that says how many stitches you may want to cast on. Methods include 2 Circulars and 4 and 5 DPNs.